The latest experimental build is now available from the experimental download page. As usual, this has been only briefly tested so expect the occasional bug. This time around there are quite a few new features including the following highlights. This feature is fairly large in scope and I’ve not yet been able to test every way it can be used so please report any bugs you find and speak up about any suggestions you have for future improvements in this area. Logins can now be edited from the right-click / context menu on the matched login menu / button. 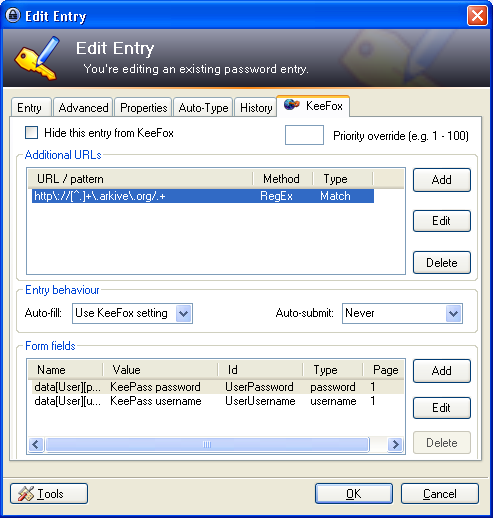 Combined with the new entry editing tab in KeePass I think the process of refining KeePass entries to behave as you intend should be much more streamlined and accessible to more users. Also, the “remember installation location” option was broken - now it’s fixed, which should help portable KeePass/Firefox users. Last but not least, it should also more-or-less work in Firefox 4. The two main areas that still need work for Firefox 4 support are the setup wizard and HTTP authentication (and similar dialog boxes) but there are likely to be numerous other bugs. 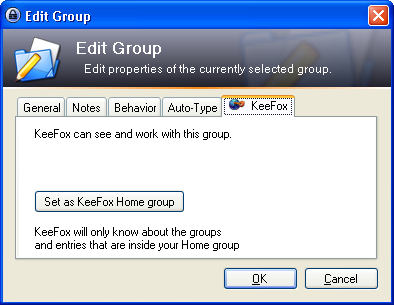 Therefore note that if you have trouble installing it into a fresh Firefox 4 profile, you may need to first install into a 3.6 profile and upgrade the profile by running Firefox 4 afterwards (or follow the manual installation guidelines).